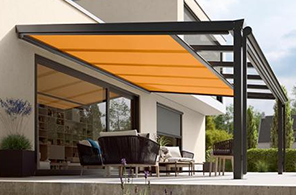 Samson awnings offer a superb range of conservatory awnings and external blinds that can be installed inside or outside the structure. Control the light and temperature inside your conservatory at the push of a button as all retractable blind units are electrically operated as standard with add on controls such as sun sensors, timer controls and thermal switches available to automate and control even when you are not there. 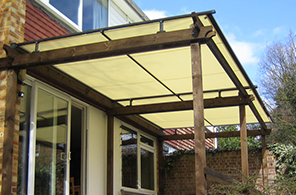 Most conservatory awning systems are electrically operated as standard on the larger sizes, and this makes daily control very easy and much more convenient. Sunlight in an important factor in enjoying your home at all times of the year, and the lightest, most airy rooms of your house tend to be the most inviting, therefor the ones you use the most. This is often the case with conservatories, however they offer very little thermal insulation during the cold winters and provides zero protection against the powerful and hot rays emitted from the sun during midday. 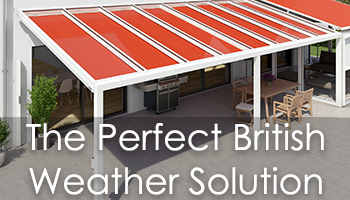 Our conservatory awnings provide a practical filter for light and heat, creating a comfortable atmosphere in both the summer and winter seasons. They retain heat in the winter, offering extra heat insulation, and reflects heat with a unique protective material in the summer providing somewhere cool to relax. This is crucial in allowing you to enjoy your conservatory throughout the year. 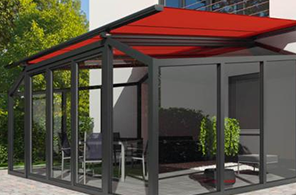 Regardless of whether the conservatory awning is mounted on the interior or exterior and irrespective of the glazing panel sizes, it serves perfectly to demonstrate the versatility and adaptability of Samson Awnings products. 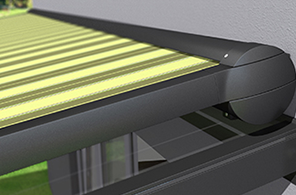 Special fabrics are produced for conservatory awnings that achieve the highest level of UV stability, and options of perforated materials to allow transparency of light, air, and water. 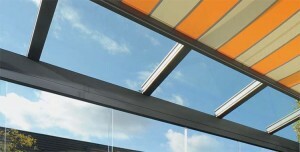 There are over 300 fabrics to choose from in the two awning ranges we offer. 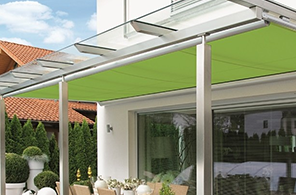 The aluminium framework for the various blinds and awnings can be powdercoated to match requirements or choose from a standard range of colours available.